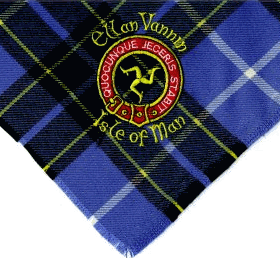 Scouting on the Isle of Man is represented by the Scout Association of the United Kingdom. The Scout Association's Island Headquarters are based at Cunningham House in Douglas. The Association does not own any campsites or other facilities itself, although some of the Groups have their own bunkhouses or campsites, in addition to their own headquarters. The Scout Association's Patron is the Lieutenant Governor Sir Paul Haddacks, and its President is a former Chief Minister, Sir Miles Walker. The Isle of Man's largest Scout Group is the 2nd Onchan Group. The 1st Malew Group were the first Scout Group on the Isle of Man. The Scouts scarf and name tag are in red and white reflecting the close relations to the Air Scouts that they were originally. The Isle of Man has attracted Irish Scouts. This was particularly the case under the patronage of Sir Charles Kerruish who facilitated the use of his own lands for Scout camping. Many groups fostered personal friendships with the Speaker of the House of Keys. In fact in 1979, as part of the island's celebration of the 1,000th anniversary of Tynwald, Sir Charles invited Irish Scouts to form part of the guard of honour for the arrival of Queen Elizabeth II. All uniformed personnel present, including the Irish guests received a specially minted medal from the Queen. It was seen a great honour that, on arguably the largest celebration ever on the island, the close link with Irish Scouting was emphasised, as they stood side by side with Manx Scouts and the large military presence who were there to honour both the island itself and the Lord of Mann. Ten Manx Scouts and one Leader attended the 21st World Scout Jamboree in 2007, as part of the Cumbria and Isle of Man Unit. Beginning at the Quarterbridge in Douglas and follow the Heritage Way along the disused Railway Line to Peel. Finish is at the Peel Heritage Centre. All hikes can be completed in any order, but all must be completed in the twelve month period. It is possible to complete the hikes either way i.e. hike from Castletown to Sky Hill to complete the Millennium Way. Scout sections for over 14s on Isle of Man include Onchan, Douglas, Northern and Southern District Explorer units, and the Isle of Man Scout Network. ↑ "Manx Jamboree Troop". Details of the members of Isle of Man Scouting who represented the island at the celebration of Scouting's centenary in 2007. www.manxscouts.com. http://www.manxscouts.com/index2.html. Retrieved 2006-07-18. This page was last edited on 28 December 2009, at 11:49.